#14. 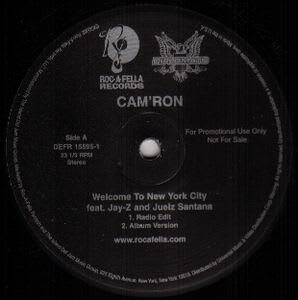 Cam'ron f/ Jay-Z and Juelz Santana "Welcome to New York City"
Besides being one of the many amazing dedications to New York that Jay-Z has been involved with over the years, this record is significant because it's the only song that Jigga and Cam have ever done together. Well, unless you count Jay dropping a verse on "Oh Boy (Remix)" that Cam'ron purposely had erased before it could be released. It's a shame too, because as Jigga and Killa trade lines in the final verse, you can't help but wonder how many more ill collaborations would have happened if they could have just gotten along.